Where do you want gifts delivered? Founded in 1998, Gifts Of Course specializes in selling luxury Belgian chocolates online and makes it easy to buy and send gift baskets internationally. Whatever the occasion - Christmas Gifts, Valentine's Day, Mother's Day Gifts, Father's Day Gifts, Corporate Gifts, Birthdays, Anniversary or Wedding - we have unique gifts to send. We offer gift baskets overseas and Belgian chocolate gifts for everyone - men, women, baby, mother, father, business partner, boyfriend or girlfriend. Discover our new Neuhaus chocolate Christmas gifts for delivery in the US. Dec 25th is Christmas Our wide selection of unique Christmas gifts is sure to delight. We specialize in corporate Christmas gifts for international delivery. We have the best Christmas gifts for delivery in the US ranging from Christmas gift cards, Christmas gift baskets, and Christmas hampers to Christmas champagne baskets. Explore Christmas gift giving customs around the world at our international Christmas gift guide. Our corporate gift service can help with gifts for event marketing and international loyalty marketing. Our international gift cards, gift certificates and gift vouchers make it easy to reward people around the world. 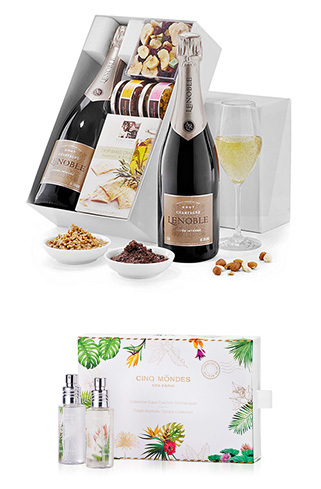 When you order from Gifts of Course, you receive the result of 10 years of experience in international gift delivery featuring the best in luxury brand names such as Godiva Belgain Chocolates, Walkers, Dom Perignon champagne, Jules Destrooper biscuits and Crystalized by Swarovski. Order gift baskets online for international delivery same day or next day.